Blood Moon Capture, But Why Red? 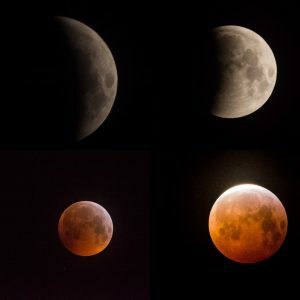 Its a puzzle why a totally eclipsed Moon turns red ? The Earth’s atmosphere holds the key. The layer of air surrounding our planet is made up of different gases, water droplets, and dust particles. When sunlight entering the Earth’s atmosphere strikes the particles that are smaller than the light’s wavelengths, it gets scattered into different directions. Not all colors in the light spectrum, however, are equally scattered. Colors with shorter wavelengths, especially the violet and blue colors, are scattered more strongly, so they are removed from the sunlight before it hits the surface of the Moon during a lunar eclipse. Those with longer wavelengths, like red and orange, pass through the atmosphere. This red-orange light is then bent or refracted around Earth hitting the surface of the Moon and giving it the reddish-orange glow that total lunar eclipses are famous for.